As if our world needs any more disasters after the Haiti earthquake, it seems that there was a massive earthquake in Okinawa, Japan today. The epicenter is the Ryukyu Islands, about 50 miles off Naha, in Okinawa. Check out the USGS information. A 7.0-magnitude earthquake struck Japan’s Ryukyu Islands early Saturday, the U.S. Geological Survey reported. 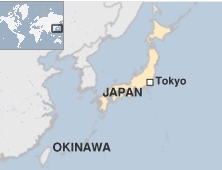 The quake was centered about 6 miles (10 km) deep and struck at 5:31 a.m. about 53 miles (85 km) from Okinawa. TOKYO, Feb. 27 (AP) – (Kyodo)—A strong earthquake jolted Okinawa Prefecture early Saturday morning, the Japan weather agency said.The 5:33 a.m. quake registered lower 5 on the Japanese intensify scale of 7. The Meteorological Agency issued tsunami warning off the main Okinawa island. A tsunami alert has been issued in Japan after a powerful earthquake struck near the Okinawan coast. 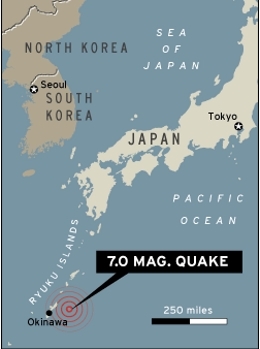 The Japan Meteorological Agency gave the strength as 6.9 while the US Geological Survey put it at 7.3. It struck at 0531 (2031 GMT), 84km (52 miles) east of Naha, on the island of Okinawa, 29km (18 miles) below the seabed, Reuters news agency reports. There were no immediate reports of casualties or damage in the country, which is often hit by earthquakes. In 1995, a magnitude-7.2 quake in the port city of Kobe killed 6,400 people. A magnitude-7.0 earthquake struck off southern Japan early Saturday, and Okinawa’s seashore was evacuated after Japan’s Meteorological Agency issued a tsunami warning.The Japanese agency predicted 3-foot waves following the quake, which hit just east of Okinawa and Ryukyu, south of Japan’s main islands. Tsunami waves also were expected on the islands of Amami and Tokaro. There were no immediate reports of damage or casualties, and the Tsunami Warning Center in Oahu said waves generated by the earthquake were not expected to be destructive.